Egypt’s military ousts Mohammed Morsi: The country’s generals now face economic turmoil, a defiant Muslim Brotherhood, and potential chaos. The country’s generals didn’t want to oust Morsi. They just want someone who can keep Egypt stable—and guarantee their perks and privileges. Does anyone come out on top in the Morsi ouster? For the enormous crowds who gathered in Tahrir Square over the past few days, the military’s announcement abrogating the new constitution and deposing Egypt’s first democratically elected president, Muhammad Morsi, is a second revolution, a replay of the ouster of dictator Hosni Mubarak three years ago. For the pro-Morsi crowds gathered in a much smaller square in a North Cairo suburb, the move, followed by the installation of an interim government, is a coup. This seems to be the view of most Western commentators as well, for whom the military’s actions fit into a tidy narrative of Egypt as a military–garrison state, long ruled by generals who viewed the rise of an elected president as a threat to their power and privileges. But this gets the situation almost exactly backward. President Morsi and his Muslim Brotherhood allies never represented a threat to the military’s interests. On the contrary, over the past two years, they proved remarkably willing to accommodate Egypt’s men in uniform. For example, the widely reviled constitution that Morsi’s allies passed in December didn’t just dial back progress on women’s rights and sneak in more fulsome declarations of adherence to Islamic law; it also enshrined the military’s place atop the country’s political hierarchy. Article 146 gives the military veto power over presidential decisions to declare war. Article 195 mandates that the minister of defense be a general. Article 197—a highly valued sop to the generals’ interests—instructs that only a military-dominated body (called the National Defense Council) can oversee the military’s budget. The constitution even has a provision preserving the military’s right to prosecute civilians. Egypt’s generals didn’t want to abrogate this constitution; they are its biggest fans. It is thus hard to see what the military gains by overthrowing the president—except for direct responsibility over a country whose teetering economy and unruly crowds gave them headaches during the 18 months they were in charge between Mubarak’s ouster and Morsi’s election. Egypt’s generals no more wanted Morsi’s ouster than they wanted Mubarak’s almost three years ago. What they want is to continue to enjoy their perquisites—including more than $1 billion a year of military aid and some of the choicest cuts of the Egyptian economy. Their ouster of Morsi puts both of these things at risk. President Obama has already hinted that the generals’ abrogation of democracy might occasion a withdrawal of U.S. military assistance—though he’s unlikely to follow through. And the young people who helped propel the Egyptian people into the streets, and compelled the military to step in and restore order, are the same people who in November 2011, during the military’s brief period of direct rule, were taking to the streets shouting “Down, down with military rule!” No matter how much Egyptians laud them today, the generals know that it is only a matter of time before the revolutionaries turn on them again. And then there are the military’s new enemies—the Muslim Brotherhood—for whom the latest maneuver is one of the most dramatic and consequential events in more than 1,400 years of Islamic history. The generals fear that the Muslim Brotherhood will not go down without some kind of fight, which is why they moved on Wednesday to pre-emptively arrest key Brotherhood leaders and shut down the movement’s television station. It remains to be seen whether these tactics will neutralize the Brothers or inflame their rank and file (who are already speaking of martyring themselves for democratic legitimacy). In short, it is hard to see how the current situation gives Minister of Defense Abdel Fattah al-Sissi and his fellow officers anything other than heartburn. If the military hasn’t won today, who has? It’s almost impossible to say. 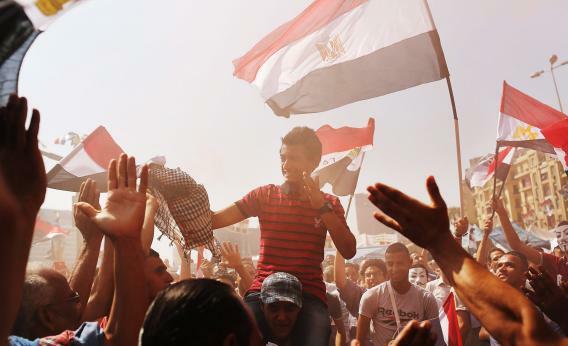 Though Egyptians are still celebrating, they are probably no closer to democracy today than they were three years ago. And though Egypt won’t likely miss the combustible, unimaginative, and inflexible Morsi, the fact that he was removed in defiance of the ballot box is not without its own costs. But if it’s hard to identify the winners here, it’s relatively easy to identify the losers: the so-called youth of Tahrir. Though Egyptian politicians talk about the square as if it’s a renewable resource—the people’s tool for rebooting their government whenever the public tires of its leaders—the reality is that every new protest wears popular patience thinner. The vast majority of Egypt’s 81 million people have never protested in Tahrir and don’t care about the Brotherhood; they simply want a return to safety, order, and regular electricity. In six months, when the young people take to the streets again to protest some inevitable violation by the generals, and the military sends out the tanks and truncheons, Egyptians will probably shrug, and maybe even cheer.